Five persons were on Saturday confirmed dead with five others missing after a boat accident along Lagos-Ikorodu waterways. The mishap which occurred around Bayeku- Igbogbo in Ikorodu at about noon was said to have been caused by a steering problem, which the paddler could not control. The boat was said to be coming from Oke Ira Nla jetty at Ajah. Aside the bad condition of the boat, the crew were said to be inexperienced and were over speeding. It was gathered that the boat had 20 passengers and two crew members, out of which 17 persons were rescued by local fishermen at Igbogbo jetty and rushed to different hospitals. It was also learnt that the enclosed nature of the boat exacerbated the passengers’ survival chances. Of the 17 rescued from the water, it was gathered that one died at Mica Hospital and four others passed on at Ikorodu General Hospital. Confirming the development, the General Manager, Lagos State Emergency Management Agency (LASEMA), Michael Akindele, said the boat captain has been arrested and was being questioned by Marine Policemen from Ikoyi. He said they got the call at about 1:29pm, more than an hour after the mishap. Akindele confirmed there were 20 passengers and two crew members on the boat, acknowledging that 17 persons have been found, with five confirmed dead. “Our investigation revealed that 20 passengers were on board and two crew members (the captain and his assistant) before the mishap. “15 passengers and two crew members were rescued by local fishermen around Bayeku jetty, Igbogbo. “Four of the people rescued were taken to a hospital at Bayeku. Three of them are presently responding to treatment while one has been confirmed dead. “Seven others among the rescued passengers were taken to Ikorodu General Hospital where four were confirmed dead, two were treated and discharged and one in critical condition. “Those who have been confirmed dead include four adult males and a female. 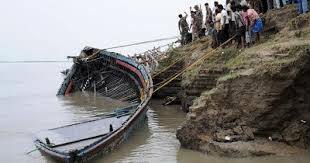 In all, 17 persons were recovered from the water,” Akindele said.